I Order You is getting better and better! This episode we delve more into the past and overall there is a more sombre approach than we are used to, however, there are fun moments and Kevin is more than happy enough to give his smile to lighten the drama (as well as the cutie BiRyong – I’m just shipping him and I from now on haha :p). We must of course, relive GookDae telling SongAh his is married… But he’s not married, because they split straight after the ceremony (I feel there is an interesting story here). GookDae tells SongAh that he was drunk and thus impulsive and that the kiss is something he shouldn’t have done. He tells her several times that he is sorry. SongAh is mad and even though GookDae goes to stop her, she leaves without a word. Stopping to think and breathe, SongAh angrily swats the hand which reaches for her and tells the person to leave her alone. SongAh thinks it’s GookDae, but a shocked Kevin is stood before her instead. 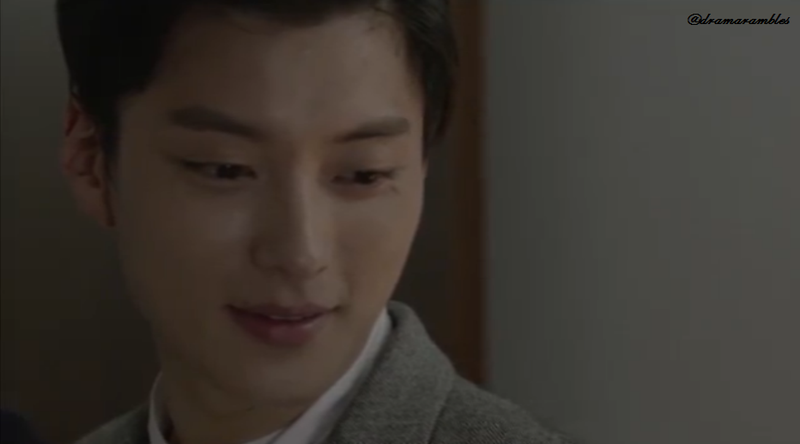 We then get to see the beauty that is a crying SongAh, and even though she is wailing about how GookDae is a jerk and that he must have been playing her, Kevin looks considerably happy. He tells her that because GookDae apologised, it must mean he isn’t a bad person (SongAh disagrees haha), but he does say that if she stops looking at the chef, she may find someone who is in love with her (casual hint there Kevin, I like it). Kevin does his best to try to cheer her up or simply be there while she vents. In the end his solo is disturbed when SongAh falls asleep on the control (which she keeps a firm hold of until she’s in her bed later on haha) and ends his turn. Kevin is then subjected to SongAh’s drunken commands and expressions while giving her a piggy-back home. Once Kevin deposits her on her bed, SongJoo becomes the protective brother and demands to know if Kevin got SongAh drunk. Kevin happily replies that her alcohol intake was all voluntary. 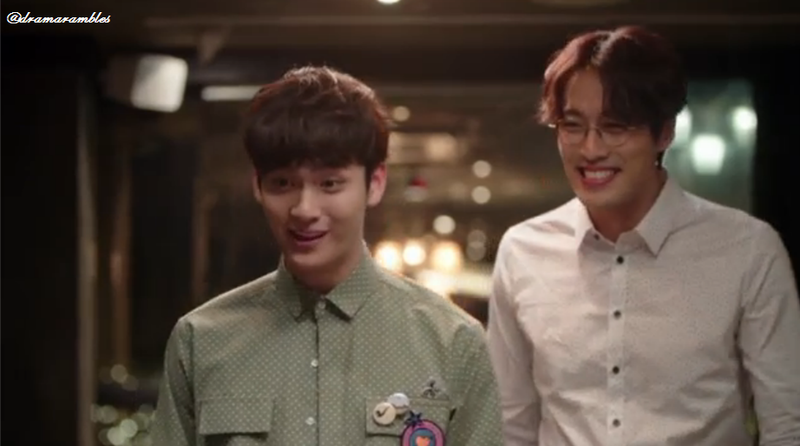 Kevin calls himself hyung and knows SongJoo by name, which causes SongJoo to question if he knows Kevin. And of course he remembers, and he beams happily as he recalls Kevin as being the hyung who would buy him spicy rice cakes (cute~). The pair then happily catch up, as well as glance at SongAh occasionally, who is singing random parts of songs in her drunken/sleepy state. The next morning arrives and SungJoo “lovingly” kicks his sister awake. He tells her to get ready or she will be late for work and then asks if she called Kevin last night, and if so she should do some serious begging so that she keeps her job. 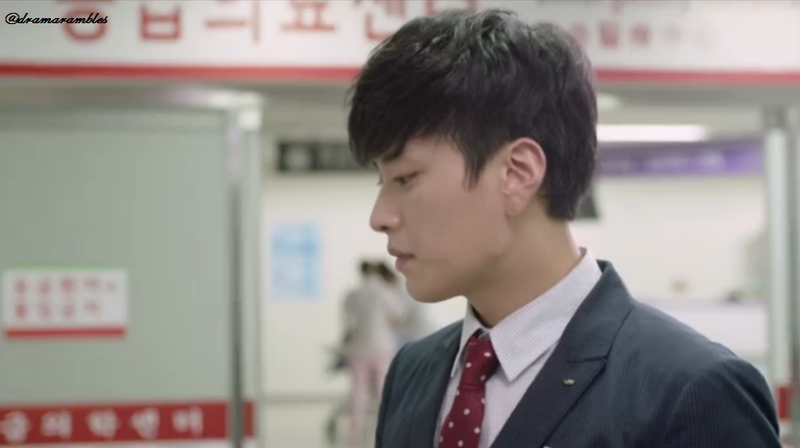 SungJoo leaves a confused, and clown-faced SongAh to remember that it wasn’t Kevin she was calling. Nope. It was GookDae! And she called him often and in several different emotional states. She went from understanding him, to hating him and wanting him to die. Suffice to say SongAh is mortified with herself. SongAh enters Kevin’s office and apologises for what happened the previous night and asks if she made any mistakes. SongAh uses formal language and looks like a naughty child waiting to be told off. However, cutie Kevin is beaming and reminds her to speak informally. 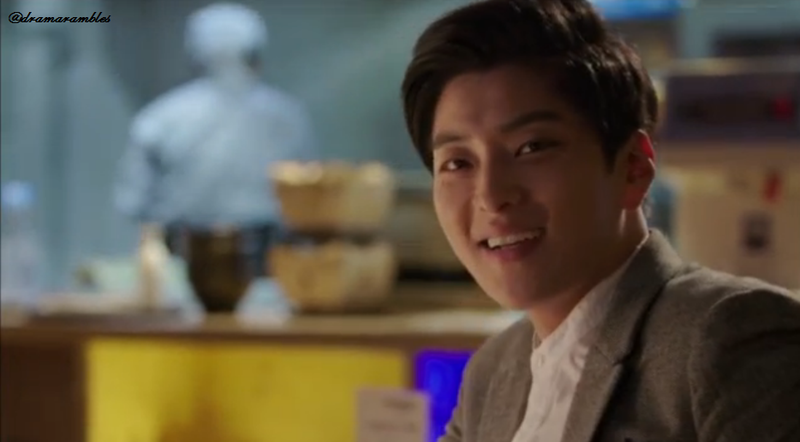 He happily dismisses SongAh’s request to pay him half for the drinks, and tells her to for dinner tonight. DoekHee catches SongAh as she leaves Kevin’s office and isn’t too happy to hear she spent a long time with Kevin last night. SongAh soon sets her straight and is once again in turmoil over the phone-call incidents. DoekHee chastises her. She tells SongAh to phone GookDae, to see if he was aware she was drunk, but SongAh is too embarrassed. DoekHee tells her to forget GookDae and walks off. But SongAh knows that he is unforgettable. On cue, SongAh gets an incoming call from GookDae, but she doesn’t pick up, even though she’s unhappy at not doing so. GookDae looks over the contract SongAh signed and recalls several cute moments (the one where she read the card from memory is one of my favourite scenes so far! So cute~), and recalls her angry and hurt expression when he told SongAh he is “married”. He puts the contract away and heads out into the restaurant. SooRi suggests they go on the ‘tour of famous restaurants’ which they missed last time and says they should invite SongAh, as one of the restaurants is near her workplace. 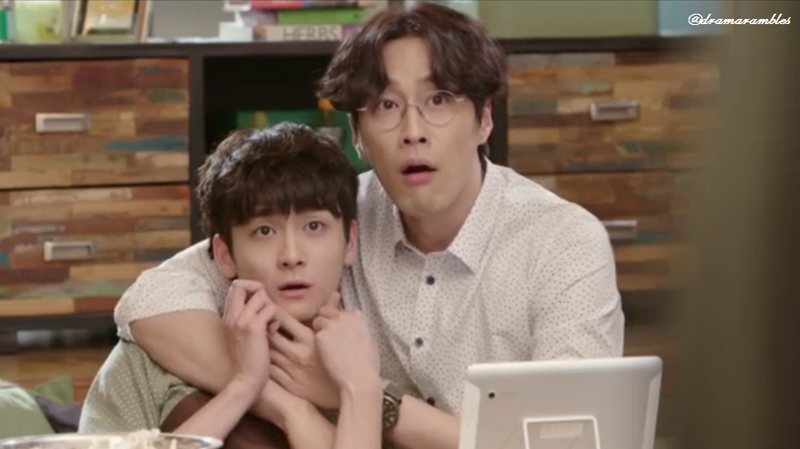 BiRyong is beside himself and pulls SooRi into his grasp and basically smothers him, but both are shocked when GookDae tells BiRyong to book a reservation. (I see where this is going and this is going to be interesting for sure! 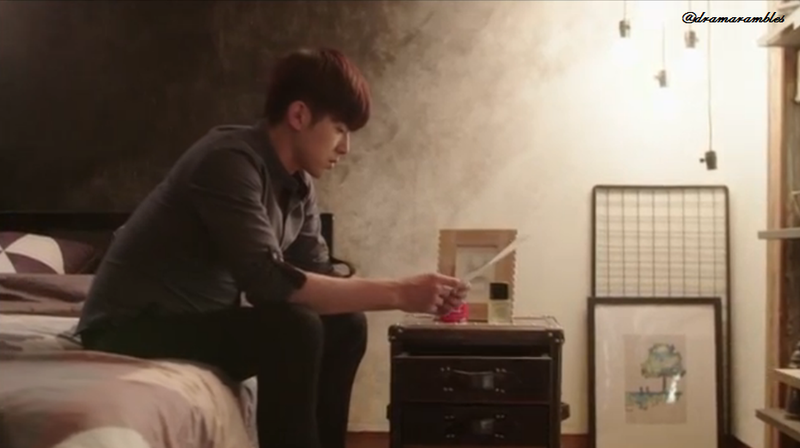 I have such a guilty pleasure of obviousness in romance dramas ^^”). While at work, SongAh nearly calls GookDae, but falls short each time. Throughout the day, she begins to cough and look unwell. DoekHee offers her medicine, which SongAh declines. Before she leaves for dinner, DoekHee tells her that if she needs her, to call, and she will take her to get some porridge (I love when DoekHee becomes like a real unnie! :3 so caring and cute ♥). A text then reminds her that she is supposed to buy Kevin dinner. 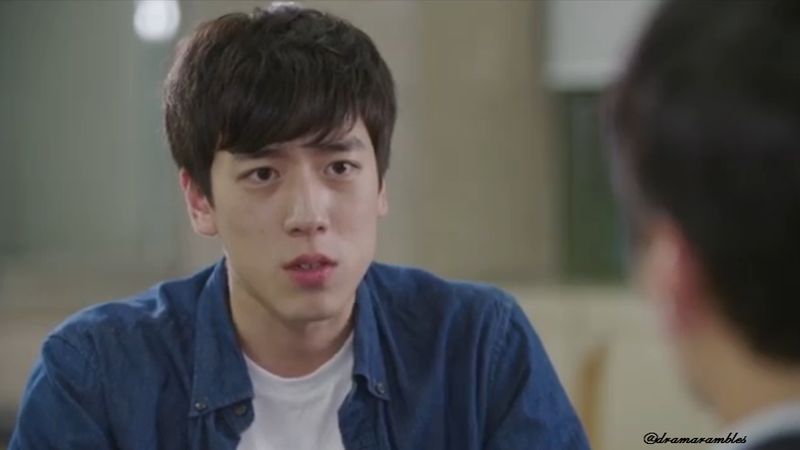 SongAh goes into his office and asks to cancel the plans and Kevin recalls that she didn’t eat lunch either. She then admits that her condition isn’t good and is then startled slightly when he puts his hand to her forehead. SongAh has a fever and he asks if she has taken any medicine, she replies that she doesn’t like taking it. Kevin isn’t happy with that, but swings it round to a positive outlook, as he tells her she should take her medicine or eat healthy foods. He promptly takes her hand and leads her out of the office to a rather pretty table in a restaurant. Kevin leaves her to go wash his hands, which prompts SooRi and BiRyong to come in and notice her. They are happy to see her, although it can’t be said to be the same for SongAh. Her mood doesn’t improve when SooRi tells her that GookDae is coming as well. SongAh is so shocked that she runs from the table, but as her condition isn’t good, she begins to feel faint at the lift. Remembering Kevin, she gets out her phone, but in her unstable condition drops it. As she scrambles to pick up the pieces her condition worsens and as the lift opens she falls into the arms of someone who knows her name (*cough* GookDae *cough* because that is how dramas work right?). SongJoo rushes out of the hospital lift (he does care about his noona!! ♥) and joins Kevin (wait, did he catch her? I was wrong? It didn’t go the obvious way?) and they watch a sleeping SongAh, who has anemia and flu-like fatigue. While sitting in a cafe area, SongJoo says that she should endure only what she can and blames himself for not making her take medicine when he noticed her sneezing in the morning. Kevin asks if SongAh must not like taking medicine, and SongJoo explains that when she takes medicine she has a habit of throwing it back up (aww poor thing!). Kevin is shocked and hurriedly asks why. SongJoo explains that when SongAh was 7 years old their mother died in a car crash on the way to buying SongAh medicine, which caused her to believe the accident was her fault. Meanwhile SongAh’s wakes as her hair is being stroked, and is shocked to see her mother. SongAh-Eomma tells her that she should have told her if she was sick and makes to go and get her some medicine. This jolts SongAh upright and she is adamant her mother shouldn’t go. SongAh-Eomma asks if she should stay by her side and SongAh agrees. The pair begin to cry (as do I ;-;) and SongAh-Eomma gets SongAh to lie down and kisses her forward. For several moments we see the beauty of seeing a mother comfort their child. However, it doesn’t last and SongAh wakes up for real. She looks at the empty stool by her hospital bed and touches her hair. Songah is sure that someone had been there, even if it wasn’t her mother. SongAh takes the drip out of her arm (which you shouldn’t do!) and goes out into the corridor. She turns the corner and see Kevin waiting for the lift. Shocked she hides and wonders if it was him. This was an episode with a lot of emotion! And not the good kinds, although there was some good humour. I always feel like these episodes are a lot longer than they actually are, in a good way! 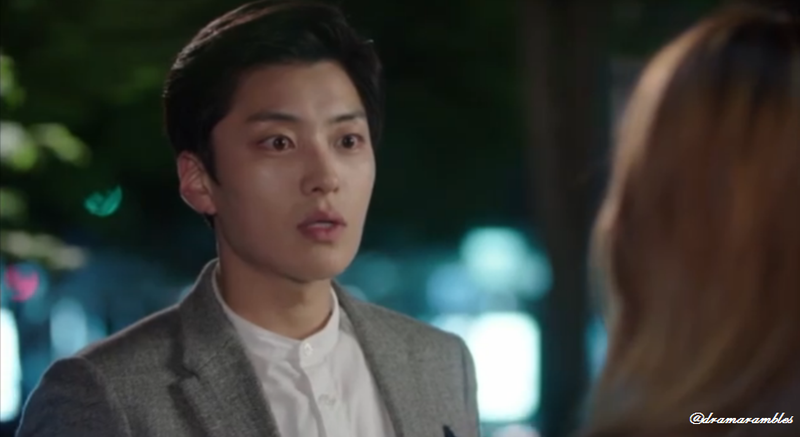 I felt that this episode was a chance to give us more second lead syndrome, because that’s the case for me. Although there I am on GookDae’s side as well (can’t they just form a polygamous relationship and make my life easier haha :p). We are definitely getting more involved with the past of the characters now and of course in true drama style there will be a connection between SongAh and GookDae because of it. That is normally the big obstacle. Even though I can kind of see where this is going, I am interested in finding out the details and seeing how it is resolved and how the pair overcome it. Also, SongJoo certainly earnt some points this episode (mainly in the latter half of the episode), to be honest the way he acts is pretty much that of a main lead – cold, mean, but concerned and loving when they aren’t looking! I’m interested to see how SongAh feels about Kevin after this episode and how their relationship changes. It’s safe to say that the love triangle is finally up and running just how it should be haha. I have one negative. Where are my cute ‘behind the scenes’ type clip at the end?! I really want those to come back! I don’t know if it’s Viki that isn’t showing them or they just don’t appear anymore, but either way I’m upset! I guess I am the only one who gets a creeper/stalker vibe off of Kevin. He just rubs me the wrong way for some reason.